The Xpedition Wealth Management CRM Accelerator seamlessly integrates with Office 365, Outlook, Exchange, SQL Server, LinkedIn and a host of other powerful third-party applications. The result is an advanced ecosystem that breaks down internal silos, increases productivity and sales revenue. It also helps you meet the ever growing compliance challenges. And of course, it provides you with the tools to deliver a personalised client experience that starts with a streamlined onboarding and KYC experience. Your data can be available to you via the power of the Azure Cloud too, meaning you can access real-time intelligence, on any platform, whether you are in the office, or on your way to your next appointment. In addition, this data is available through Dynamics 365 on your laptop, tablet or mobile. Your data is also backed up with one of the highest certified, enterprise-grade cloud platforms on the market. With more certifications than any other cloud provider, Azure leads the way with security standards that others follow. Power BI is an Azure cloud-based analytics service that enables you to analyse data with greater speed, efficiency and understanding. It transforms your company’s data into interactive, easy-to-understand graphs and charts, and helps you recognise significant trends so you can focus your attention on the things that are critical to business success. 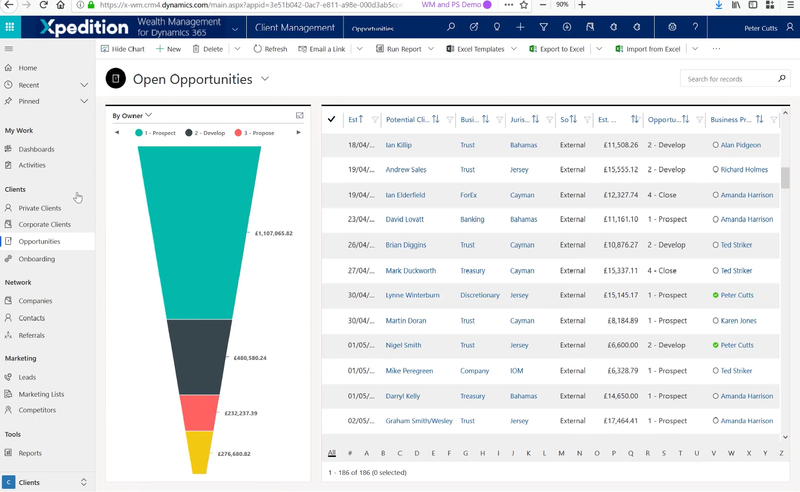 Power BI is the next generation of business intelligence applications, making it easier to make sense of the wealth of data available to you, in a visual format that makes it easy to interpret and action. 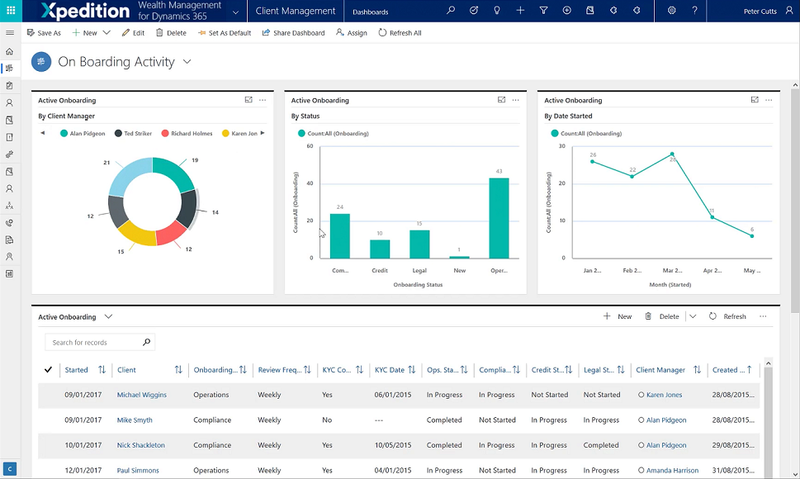 Dynamics 365 Portals help you deliver an online client experience clients have come to expect. Enable clients to access their information online, access their account details, update personal information, and raise client service requests. Portals also allow clients to search the database with any queries they may have. The database features an intelligent search function that surfaces potential solutions, increasing the chances of a resolution, and reducing the number of client requests you may need to deal with. Cases that do need to be raised move through a custom business process flow where automated emails inform clients you have acknowledged their request, helping you deliver on the promise of a 24/7 service interaction. ClickDimensions is a leading marketing automation solution built inside the Microsoft Dynamics 365 platform. As a ClickDimensions Gold Partner, our consultants are experts in building advanced marketing automations that further your client engagement aspirations. 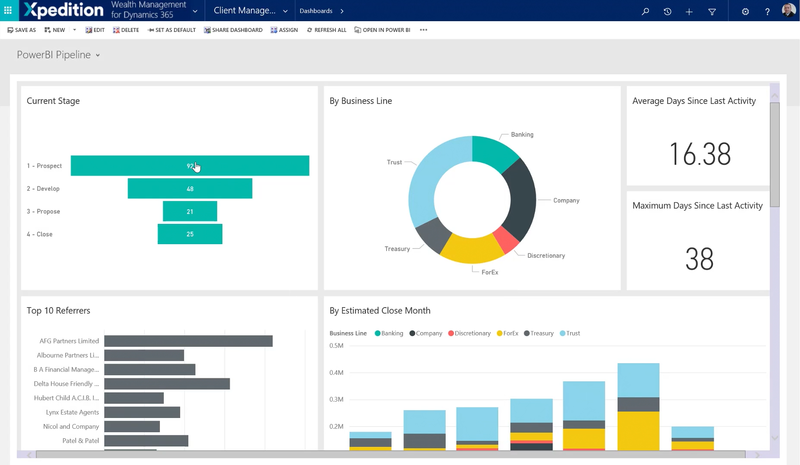 Unlock your data’s full potential with the combined power of Dynamics 365 Client Engagement solutions and AI. Create smarter marketing that meets client demand. And resolve their issues faster to increase client retention. In addition, increase your BD team’s chances of securing more wins with actionable intelligence that lets them know what to focus on so they can close more opportunities, faster. Whilst Excel is useful, it won’t help you achieve digital transformation. The Xpedition Wealth Management Accelerator is a bespoke solution that can be tailored to meet your specific needs. It is your catalyst for next-generation client engagement. Increase productivity through the formation of an advanced ecosystem that combines Office 365, Outlook, LinkedIn, Teams, SQL Server and Microsoft Exchange, plus much more. Help you deliver a secure, real-time, digital client experience that is built on trust and transparency. Enhance your human capital, create the 'hybrid-advisor', and provide your team with the tools that will help them strengthen their client relationship. Build complex marketing campaigns that deliver tailored messages to your clients at the right time, helping further solidify these vital relationships. Create a comprehensive data management strategy that that helps ensure you are able to meet the latest regulatory and compliance demands. Access your secure data anywhere, anytime, whether in the office, on your laptop, your tablet, or your mobile. Construct complex, streamlined, automated workflows that helps free up time so your team can focus on both your current clients, and potential prospects. Strengthen your resilience against the growth of robo-advisors, fintechs, ‘big tech’ and digital-only wealth management challenger firms. Secure your data so you spend less time worrying about it, and more time analysing it to identify your best leads and prospects, and source your next best opportunities. The Dynamics 365 Wealth Management Accelerator integrates with a host of leading third-party applications. In addtion to the standard Outlook integration, the CRM also integrates with LinkedIn, Power BI, Docusign, and many more industry leading third party applications that will take you further. Xpedition is also a Gold Partner of ClickDimensions, the leading Microsoft Dynamics 365 marketing automation solution, expanding your 'client first' initiatives. Xpedition's comprehensive, in-house development experience also means we have the skills to further tailor the solution to meet your firm's requirements. We have the know-how to integrate the CRM solution with a host of other third-party software solutions that you are currently using. For example, if you have some essential accounting software or a custom events and marketing platform that you want integrate iwith the Wealth Management CRM Accelerator, chances are, Xpedition has successfully tackled a similarly complex challenge before. Whatever your needs, Xpedition will help guide your path to growth.